Not actually every Indian dish needs spice powders but some preparations badly needs a specific combinations of spice powders!it becomes a representation of that particular Indian cuisine.vangi bhath masala powder recipe too is one such important spice mix needed to make vangi bhath but not only that you can add it to make some selected curries and gravies. The dry coconut or kopra is an important ingredient that should not be skipped if you don’t have dried kopra you can use desiccated coconut that is readily available in big super markets.For making Bisibela bhath powder too same lists of ingredients will be there but additionally some two or more spices may be needed.Iam thinking to try Bisibela bhath with this Vangi bhath powder and lets see how it will turn out.Roasting coconut is optional I have added it as such and did the grinding part.Its a kind of unique masala that gives a special taste to the dishes you make.All the ingredients should be roasted to perfection to get a flavourful powder. 2.Take a kadai first dry roast khusakasa take out and dry roast every thing except coconut and turmeric till nice roasted aroma fills the space. 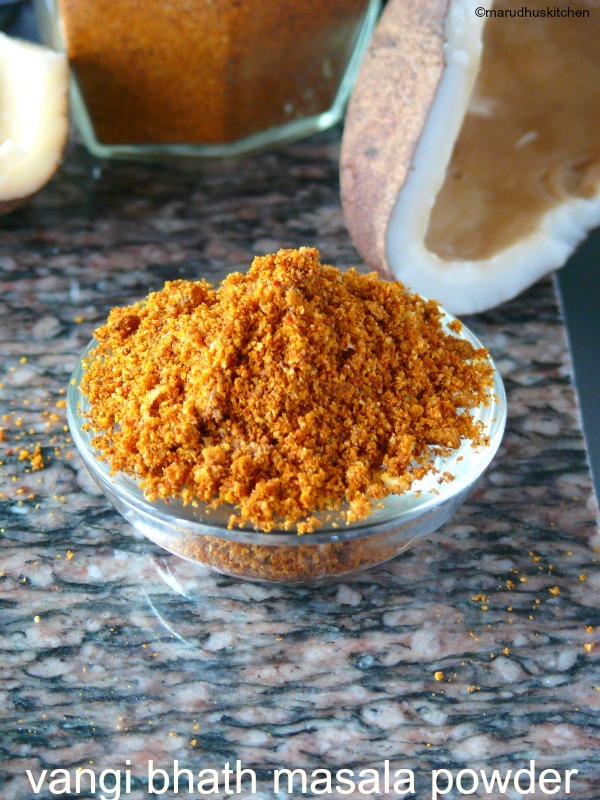 3.No need to roast coconut and turmeric powder put as such and powder along with other ingredients. 4.Let all the ingredients cool. 6.This is the powder used for making vangi bath rice. Take a kadai first dry roast khusakasa take out and dry roast every thing except coconut and turmeric till nice roasted aroma fills the space. Noneed to roast coconut and turmeric powder put as such and powder along with other ingredients. This the powder used for making vangi bath rice. Its not desiccated coconut its kopari or dry coconut that is used for making this powder. If kopra is not available can use dessicated coconut. Every thing should be rightly roasted to get a perfect powder. I have never heard of vangi bhath masala powder, but I am drooling looking at the ingredients list. I am sure it tastes awesome. I can almost smell the aroma….Love a spicy and hot Vaangi Bhaat…. One of my fav quick one pot meals for weekends…lovely share! !